1997 Festival of American Folklife, African Immigrant Folklife program (FAF1996_0933). 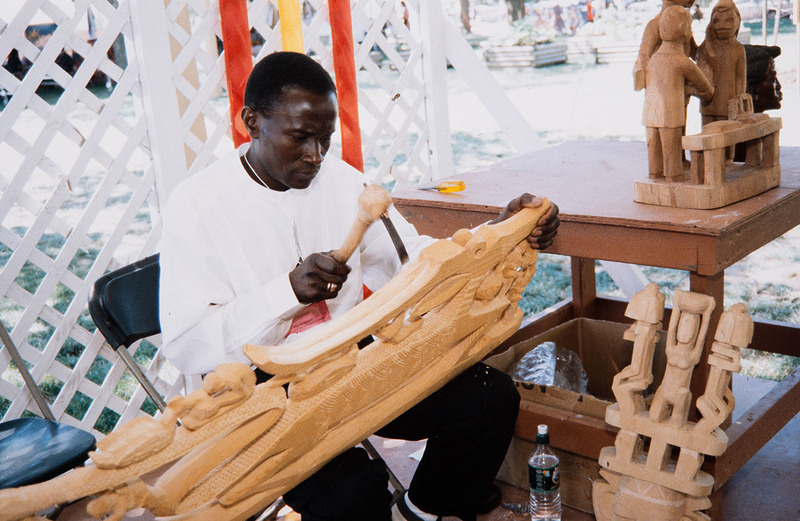 1997 Festival of American Folklife, African Immigrant Folklife program (FAF1997_0290). 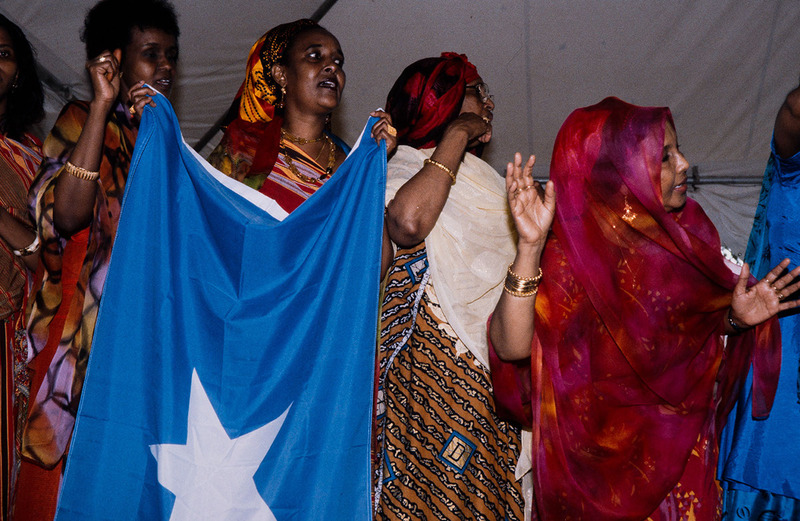 1997 Festival of American Folklife, African Immigrant Folklife program (FAF1997_0293). 1997 Festival of American Folklife, African Immigrant Folklife program (FAF1997_0580). Photo by Harold Dorwin. Courtesy of the Ralph Rinzler Folklife Archives and Collections, Smithsonian Institution. 1997 Festival of American Folklife, African Immigrant Folklife program (FAF1997_0671). 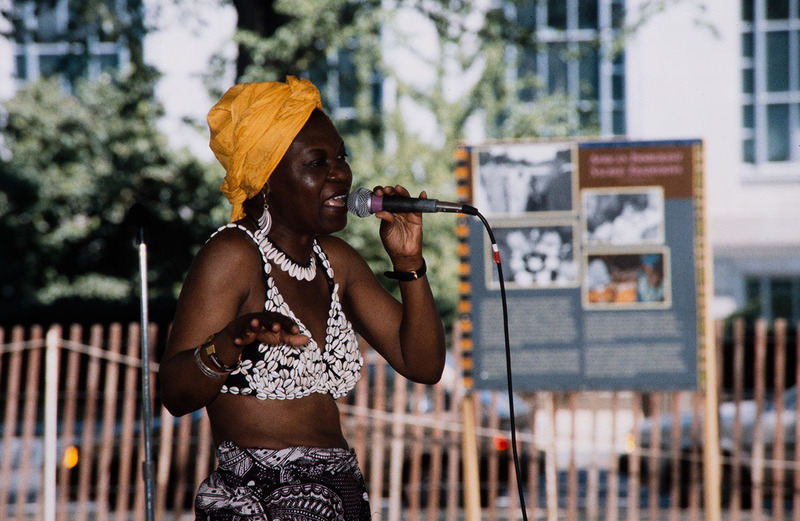 1997 Festival of American Folklife, African Immigrant Folklife program (FAF1997_0702). Across the Washington metropolitan region, African immigrants actively redefine their ideas of tradition and community by creating institutions and events that draw on African expressive forms. African-born area residents establish language and culture schools where their American-born children learn the social and artistic skills of their ancestral homes. 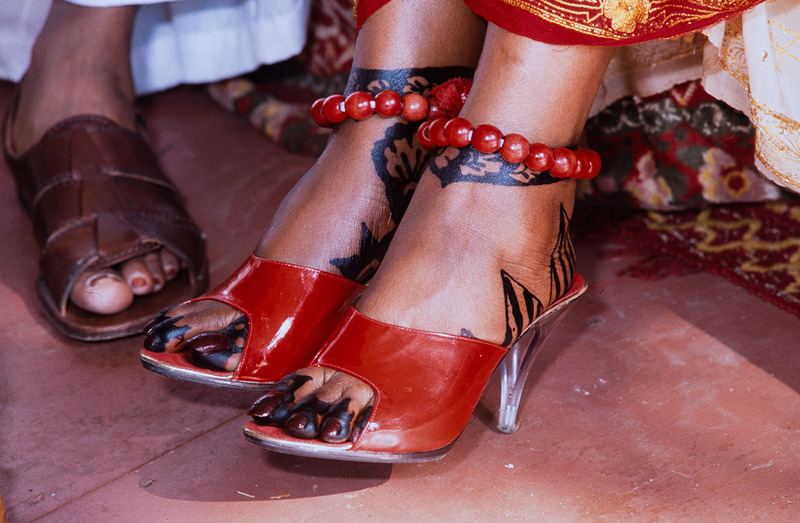 Family and friends come together to celebrate births, weddings, and other rites of passage. African immigrant entrepreneurs employ their knowledge of personal adornment and of the social needs of their home communities to serve fellow immigrants and other Washingtonians. The Festival program explored several cultural dimensions: the use made of knowledge, skills, values, and expressive forms brought from home to construct new communities and identities; and the new traditions, growing from encounters with groups in the African Diaspora and in American society as a whole, that contribute to the rich cultural landscape of the United States. As continental Africans living in the nation's capital region have increased in number, they have stamped their presence on the ethnic map and cultural calendar of the area. Africans present cultural programs, conferences, and forums about their communities. Using traditional skills and knowledge, African-born entrepreneurs develop services for immigrants and the community at large. African immigrants bring to America ideas of ethnic and region-based organizations that were devised when Africans flrst migrated from rural towns to urban centers in Africa. These patterns of organization continue in the United States. Community institutions sometimes use traditional forms of social organization like tontines - revolving credit and savings societies - other kinds of investment groups, burial societies, and town associations to get things done. 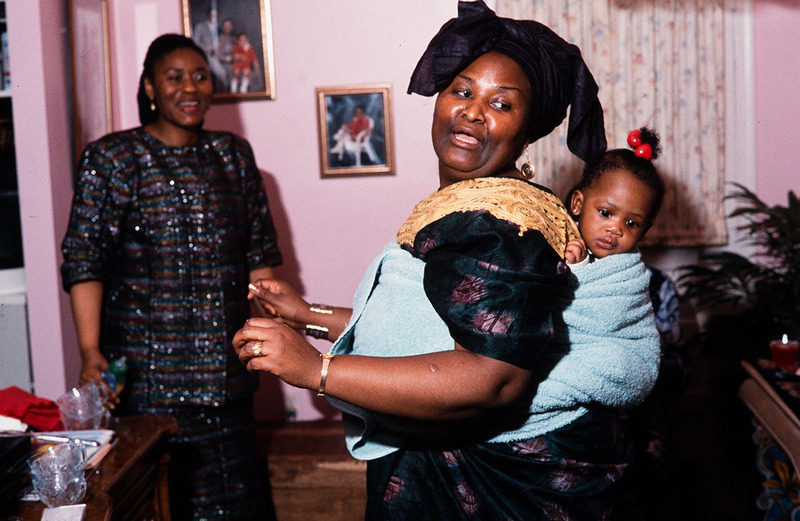 As African expatriates become immigrants, and as immigrants become citizens, they use aspects of traditional culture to maintain connections with their roots, affirm their identity, maintain positive selfimages for their children, express their links to other African world people, and assert their unique contribution to their land of adoption. The multi-year Festival program sought to contribute, through its research and public presentations (see also the 1995 concert series that inaugurated the project), to greater understanding of the cultures and experiences of continental Africans living in the United States, and in particular to promote connection and collaboration between Africans in America and African Americans, between Washington's immigrants and its long-established populations. 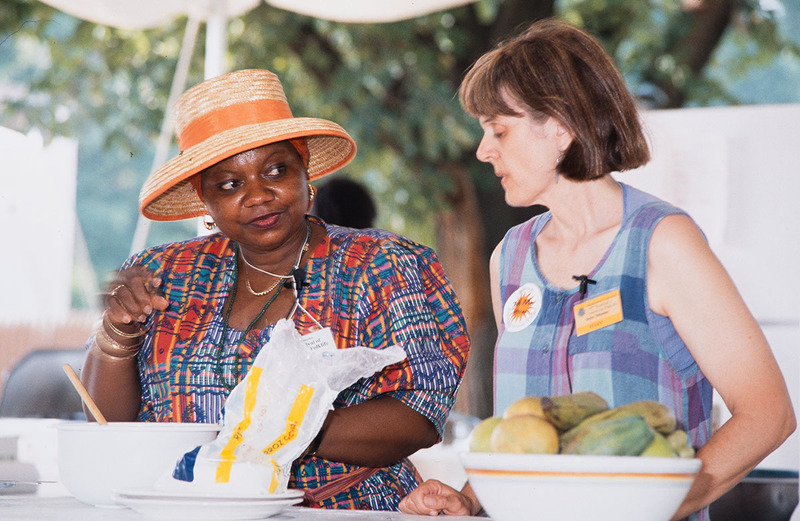 Betty Belanus and Diana Baird N'Diaye were Curators, and Khadijah Mann was Program Coordinator. Community Scholars and Curators included: Dagnachew Abebe, Veronica Abu, Ebo Ansa, Nomvula Cook, Abdirahman Dahir, T.V. Erekosima, Florence Guindo, Tesfaye Lemma, Nabil Makar, Mumia Shimaka Mbasu, Gorgui N'Diaye, Kwaku Ofori-Ansa, Gilbert Ogunfiditimi, Ann Olumba, Dorothy Osei- Kuffuor, and Aristide Pereira. Project Advisors included: Raymond Almeida, Hayelom Ayele, Camilla Bryce-Laporte, Roy Bryce- Laporte, Laura Bigman, Olivia Cadaval, Anna Cisse, Qamar Dahir, Yosef Ford, Ena Fox, John Franklin, Hassan Gure, Wellella Hirpassa, Rukia Hussein, Philippa Jackson, Portia James, Hermele Kebede, Niani Kilkenny, Mama Konta, Michael Licht, Deborah Mack, Kinuthia Macharia, Phyllis May-Machunda, Fekadu Mergessa, Sulayman Nyang, Sharon Ogunfiditimi, Peter Pipim, Nenzi Plaatjies, Sharon Reinken, John Roberts, Beverly Robinson, Fath Ruffins, Yane Sangare, Osama El Sayed, Peter Seitel, Nana Sheshibe, Marie-Therese Thomas, and Addissu Tolessa. Support for this program came from the Smithsonian Institution Educational Outreach Program and the Recording Industries Music Performance Trust Funds. Yoruba Naming Ceremony in Washington, D.C.
African Immigrant Music & Dance in Washington, D.C.